With all of the drama in Genoa City, some of the characters seem to have accepted that Adam Newman is gone and moved on, not Chelsea though. Now that she has safely retrieved her and Adam’s son Connor from Chloe, it seems to be hitting her even harder that Adam is missing, she even asked Victor to look for his son. In a recent The Young and the Restless promo video, Chelsea’s Mom Anita appeared worried about her. Anita thinks Chelsea is losing her mind because Chelsea thought Adam was at the door. Everyone believes Adam died in a car crash, the car exploded and burst into flames before they were able to retrieve his body from the car, Chelsea must be nuts if she thinks Adam is knocking on the door. Generally soap opera characters get approximately nine lives before they really die. It’s a general rule, if there is no body nor funeral, then the character will return. 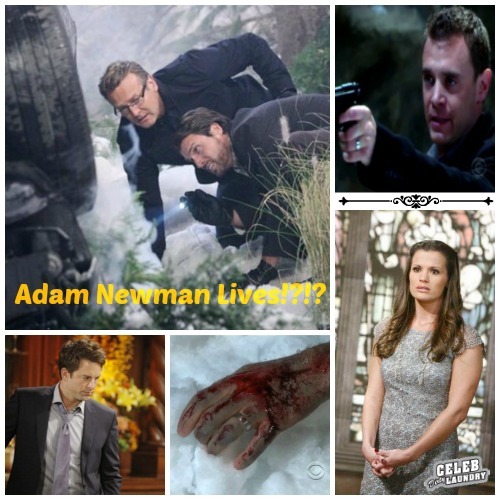 Y&R fans and CDL predicted Adam Newman would be back, and it appears they are right, all the tell-tale signs are there. The body was never recovered, then we saw a flash of a bloody hand in the snow, and now his ex-wife is convinced he is not dead. The real question in is, who will play the character of Adam Newman? Michael Muhney played the role of Adam Newman for a little over four years. After a controversial sexual abuse accusation, The Young and the Restless fired Muhney, and his last episode aired on January 30th. When Adam Newman returns on The Young and the Restless, he won’t be played by Michael Muhney. Several sources reported that Y&R producer Jill Farren Phelps was holding closed sneaky auditions last autumn and interviewing potential actors to take on the role, but Y&R has been tight-lipped about the identity of the actor taking on the role of Adam Newman. Do you think Chelsea really is losing her mind, or the Y&R writers are just setting the stage for Adam Newman’s return? What actors would you like to see take over the role for Michael Muhney? Share your thoughts in the comment section below, and don’t forget to check CDL tomorrow for more The Young and the Restless spoilers.